What makes a system trouble free and easy to service is good installation. Teletronics installers are craftsmen. They take pride in their work. Teletronics installs surge protection and ups battery back-up units on all their systems for system protection. We fish cables through walls, whenever possible, to conceal them for neatness and protection. We use plastic covers over connecting blocks for safety. We label all cables so service technicians can identify and make repairs quickly. 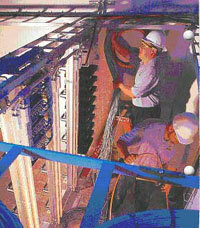 Technicians care about the appearance of their work and take great pride in their installations. A recent FEMA report estimates that 40 – 60% of small-to-midsized businesses won't survive a data calamity. Yet other priorities and financial constraints often push business continuity to a back burner. But what if there was a comprehensive backup, disaster and recovery solution that's practically maintenance-free and priced to fit small business budgets? Our comprehensive mobile device management services reduce costs associated with supporting an array of mobile devices. We have the ability to separate personal and company data while maintaining full control of polices and device configurations. We work with you to define your company's mobile strategy and ensure the policies we create increase both productivity and employee satisfaction. We provide 24-hour emergency service on office telecommunications systems and business office phone systems. How good are our products and installations? We back all new systems with a 5-year warranty on parts and labor. Most of our competitors offer a 1-3 year warranty. We do not offer maintenance agreements at the end of the warranty period. Our equipment has proved itself to be very reliable. We've found that it is much less expensive for our customers to pay for the occasional service problem than to be charged a monthly maintenance fee. When you choose Teletronics as your vendor you will get the service and support that you thought no longer existed. We respond quickly and work hard to correct problems properly the first time. Our customers are our very best sales people. We hope you will select and call some of them from our user's list. Ask them about our service. We have hundreds of customers throughout Arizona. We service small and large companies and many professions. We can bring this experience to you. Service stops with many companies when you sign the contract. Teletronics becomes a part of your team and will work with you to help you stay ahead of your competition. All Teletronics technicians have cellular telephones. We have the capability to communicate with our customers and respond quickly to their needs. We have the best-equipped trucks in the business. All of our trucks have the tools, ladders and test equipment needed to do the job. The fleet is well maintained and stocked. Businesses often discover that they need to expand, move or change their telephone systems. Teletronics has one of the lowest rates of its competitors. This can mean thousands of dollars in savings to you when you need changes made.